Our friendly, knowledgeable doctor and staff are here to give you a healthy, functional and beautiful smile. 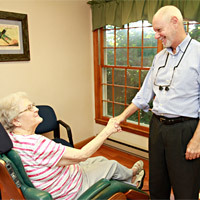 Blacksburg Denture & Implant Center offers full service for everything dentures. Dr. Munz focuses on creating fully stable dentures supported by dental implants. Our dentures are made for strength and produced with some of the most durable synthetic materials—meaning they are built to last! They are fully comfortable and strong enough to allow you to eat your favorite foods, including vegetables and other healthy items that belong in your diet. To craft your dentures, Dr. Munz can use either high-quality acrylic or state-of-the-art zirconia—an ultra-strong and lifelike dental ceramic that is among the latest advances in dentistry. In any case, your dentures will be stable and durable, and they will have a natural look, giving you the confidence to smile freely. Dr. Munz is very knowledgeable and experienced in doing full-mouth restoration for those with extensive tooth loss, or those needing tooth extraction and replacement. 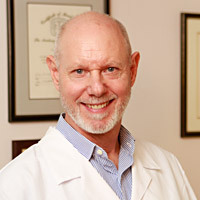 Dr. Munz is a Founding Member of the International Academy of Mini Dental Implants and a Fellow of the American Academy of Small Diameter Implants. He is also a member of the American Academy of Implant Dentistry, the American Dental Implant Association and the International Congress of Oral Implantologists. 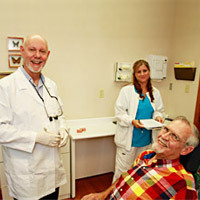 Over the years, he has placed thousands of implants to support dentures and crowns. 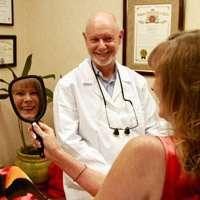 Dr. Munz gives patients friendly and gentle care and is always aware of their comfort and individual needs. You’ll find that we genuinely care about you. 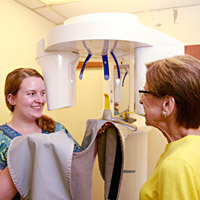 We’ll listen to your questions and concerns, and provide treatment options that are right for you. Our goal is to give you a beautiful smile with quality dentures you can depend on. Our office is designed for maximum comfort and relaxation. You’ll feel right at home in our waiting area with its leather couch, pleasant wall photos and TV. You won’t detect any “clinical” smell because we have an ionizer to keep the office fresh. Extractions and implants are made as comfortable and convenient as possible by doing them within the same visit and with proper medication. All patients are pre-medicated so they are numbed and relaxed by the time of the procedure, and also given proper medication afterwards to ensure there is no post-treatment discomfort. Dr. Munz makes sure all treatment goes smoothly, and uses the strongest dental anesthetic to ensure that the patient is feeling relaxed. He won’t proceed with treatment if a patient feels even the slightest bit of discomfort. While some dentures have been known to look unnatural or fake, our dentures are made from the best material available, and have a lifelike aesthetic quality to them. By using harder material to make our dentures, we can make your teeth with thinner, sharper edges, more like natural teeth. In certain cases, Dr. Munz wil use special, small-diameter implants called “Mini Dental Implants” to support the restorations needed for tooth replacement. These MDIs are minimally invasive, require less post-surgery healing than regular-sized implants, and leave a very small “footprint” in your mouth. Dr. Munz is highly skilled and trained in the use of MDIs and know how to replace missing teeth using MDIs without making compromises for strength and durability. Patients who Dr. Munz treated with Mini Dental Implants many years ago still report their implants to be functioning perfectly. Here at The Denture Center we listen to your concerns, answer your questions and do our best to give you as much helpful information as you need. Dr. Munz thoroughly explains the procedures to you throughout the process of restoring your smile. His goal is to give you an attractive pair of functioning dentures that can serve their purpose as synthetic teeth without adding any burden to your daily life. Dr. Munz guarantees that he will make any number of changes to your implant-supported dentures to give them the look and feel you want. He will work with you until you are completely satisfied with the results. Our office is set up to deliver service quickly and efficiently and there are little to no wait times. Treatment is also efficient; Dr. Munz uses streamlined protocols to make your visits productive and comfortable. From beginning to end we have every step smoothed out for the patient. After many years of providing implant-supported dentures we know what might arise and how to eliminate multiple visits or procedures. Our implants and dentures are very affordable. We offer patients various payment options, including CareCredit for financing, and we help our patients maximize benefits from their dental insurance.